I loved The Karate Kid and its story of an underdog protagonist learning karate to stand up against his bully. Not only did the movie show off the benefits of training and discipline, it developed the patriarchal bond between student and master. The first season of Shun Matsuena's Kenichi: The Mightiest Disciple takes the premise of The Karate Kid and repeats it for 26 episodes with mixed results. The anime starts with the titular Kenichi believing that martial arts will help him against his school bully. Pitying Kenichi, his quirky new friend Miu - who looks like she smuggles beach balls inside her shirt - introduces him to her grandfather at his dojo. After training under one of the six residing martial arts masters, Kenichi gains the skills to defeat his bully in a karate match. 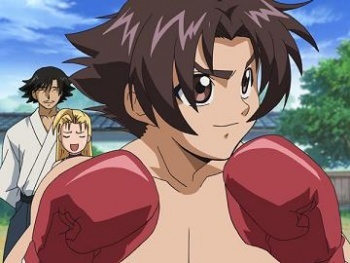 However, the martial arts victory only escalates Kenichi's problems as stronger fighters challenge him and force Kenichi to repeat the process of learning new skills from his masters. During the course of the series Kenichi is forced to fight bullies, recruiters for street gangs, and eventually the actual gangs themselves. The series spreads itself too thin and suffers because of it. Kenichi: The Mightiest Disciple flits between martial arts action, romantic drama, and screwball comedy. While competent at all, it excels at none. Kenichi's martial arts battles boil down to his use of hitherto unknown moves that are followed with brief flashbacks showing one of his martial arts masters teaching him the move he just used. The fight scenes themselves are rarely animated as freeze frames pause the fight choreography and movement. During massive fight scenes the camera focuses on people observing the fight or on nearby landscapes instead of showing the actual brawl. Something is wrong when a martial arts action anime lacks the animation budget to animate its martial arts action, though they spared no expense animating Miu's jiggling breasts. The series adds occasional romantic tension by reminding us that Kenichi has feelings for Miu and struggles to tell her, while another girl attempts to confess her own feelings towards him. But the romance elements fall flat after noticing that the lead characters are too dense to notice the feelings of their admirers, perhaps as a result from taking too many kicks to the head. Kenichi takes a lot of physical punishment while training, which parodies the training featured in several martial arts movies. The over-the-top training combines well with Kenichi's over-the-top whining to provide screwball comedy. But the slapstick gags are repetitive and seeing Kenichi flying through the air or smashing through a wall after an insanely powerful punch loses its appeal after the umpteenth time. Looking past the flaws, Kenichi: The Mightiest Disciple is casual anime. The story is simple with each arc focusing on Kenichi eventually triumphing over his opponent. The sudden shift in Kenichi fighting school bullies to Kenichi engaging in street gang warfare is initially hard to swallow, but the shift allows the series to better develop the characters Kenichi encounters. Each major character usually specializes in at least one form of martial arts and enables the series to show off the subtle differences in martial arts styles. All in all, it is light entertainment that does not require much thinking to enjoy. Differences between the dubbed and subtitled versions are minimal. The English dub serves Kenichi extra whine and uses PG-rated euphemisms to describe Miu's bouncy, bountiful bosoms. Kenichi: The Mightiest Disciple will not win awards for originality or innovation since the series largely sticks to the action anime formula seen in shows like Naruto, Bleach, YuYu Hakusho, and Ranma 1/2. The show tries to remain grounded in realism in an attempt to set it apart from the others, but it's hard to recommend it wholeheartedly. If Kenichi: The Mightiest Disciple does nothing but remind you of another series, you might be better off just watching that other show instead. Bottom Line: Kenichi: The Mightiest Disciple features the martial arts combat of Naruto without the ninjas, the rivalry between Shinigami squads of Bleach without the supernatural Hollows, and the ridiculous training of Dragonball Z without the famous brand name among anime fans. The show is watchable, but fails to stand out among the sea of generic action anime. Recommendation: At best, Kenichi: The Mightiest Disciple is worth a rental as a substitute to anime reruns on cable television. Otherwise, skip this forgetable series. While Tom Tonthat gave up karate training in favor of guns, he can still execute a swift crane kick on drunken college students banging at his door at 3:00AM. The first season of Kenichi: The Mightiest Disciple spans 26 episodes split into two DVD box sets. Each box set features 13 episodes.